Afraid of the expected announcement of AMD’s Threadripper version 2 during AMD’s keynote the following day, Intel could not resist to try to steal some of that thunder. The Intel team decided to haphazardly demo a unlocked and overclocked server part as their next generation high-end desktop cpu. Hardware website Tom’s Hardware tracked down the system which was used in the demonstration of the announced Intel 28-core 5 GHz processor during the Intel Computex keynote.  The demo wowed most of the audience present at the keynote, mistakenly assuming that the processor was capable of reaching 5.0 GHz at stock speed. However, to trained eyes it is very clear that the yet unnamed processor was overclocked. One of the telltale signs was the heavy use of insulating materials to combat condensation. 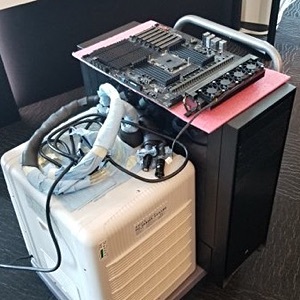 The team of Tom’s Hardware later uncovered the source of this condensation: Intel used a 1,000 Watt water chiller that was hidden under the table to cool the processor. One could clearly see the tubes running from the case to the cooling solution. 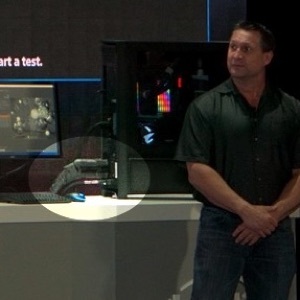 Intel’s custom cooling solution for their 28-core 5 GHz demo as uncovered by Tom’s Hardware. Another sign was the information displayed on screen during the benchmark test. 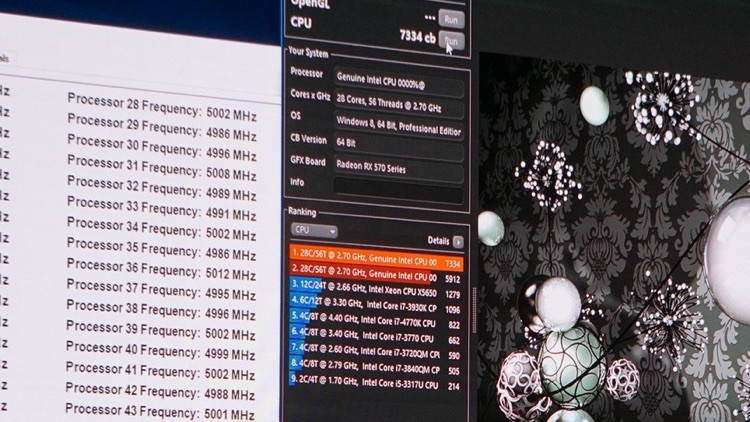 As Cinebench R15 was used to showcase the performance, it displayed the processor as ’28 Cores, 56 Threads @ 2.7 GHz’. Tom’s Hardware also shed some light upon the source of the processor Intel used to perform the overclock. The most probable processor in Intel’s stable is the Xeon Platinum 8180, which offers 28 cores and carries a hefty $10,000 price tag. One can only speculate on why Intel would put in all this effort to woo the crowd. We can only conclude that Intel became aware of the upcoming Threadripper announcement with more cores and needed something that would distract the public of the delays Intel is experiencing in development of the 10nm process.